To help you better prepare yourself and your family to fight the bite, Orkin presents the “Buzzer Beater” app, which features its deep scientific knowledge of mosquitoes. Are you prepared for mosquito season this year? Take the quiz to see if you’re ready to earn your badge in Mosquito Season Prep. Watch the “How to Deal With Mosquitoes” & “Do Mosquitoes Prefer Adults over Children” videos, as well as the rest of Orkin’s How-To video series, to get the most up-to-date knowledge on dealing with pesky home invaders. Are you prepared for mosquito season this year? 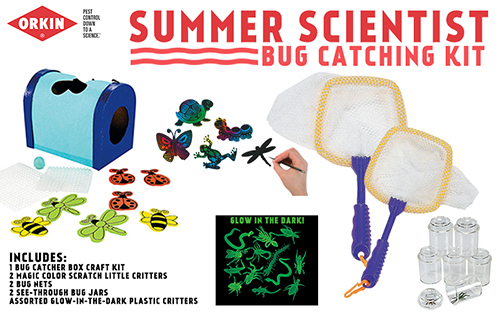 Enter to win this cool bug catching kit. Just enter on the form below and good luck! "I received a Summer Scientist Bug Catching Kit in exchange for this post." I learned that bug spray is effective initially but begins wearing off as soon as it’s applied. This really did help and I really didn't know that , wow!! I learned that male mosquitoes feed on plant nectars, but female mosquitoes also bite in order to extract protein from blood to use in egg production. I was surprised to learn that ants can live over a week under water. I learned that mosquitos prefer adults over children because they have more CO2. Also, walk around the yard and pour out anything that is collecting water. Don't forget to check your gutters. That's one place I didn't think about. I didn't know they prefer adults over children, interesting! They perfer adults over kids. Apparently I need those yellow bug lights like my mom used to have;(show of hands please) who knew this! I also didn't know that perfume could attract mosquitos. I also learned that they seek the proteins. I like knowing the times to stay inside! I was surprised to learn that mosquitos prefer adults over children! I learned that the bright yellow light is better than blue anti-mosquito lights or regular lights for keepign mosquitoes away. I did not know that bug spray begins to wear off as soon as you put it on. I learned that: Bright colors have not been proven to attract adult mosquitoes, but strong smells like perfumes, scented soaps, and lotions do. Standing water sources and hot exhaled gases also attract mosquitoes. i didnt know mosquitoes prefer adults over children interesting !! I learned that adult mosquitos are attracted to smells such as scented lotions & soaps! I learned that perfume can attract mosquitos. I learned that mosquitoes prefer adults over children. I would never have thought that. I learned that ants can live over a week under water.